Happy new year! My first post of 2017! Wishing all a bright start to a beautiful year! Since the Year of the Rooster is coming, I thought it would be apt to post a cute baby Rooster orange chiffon cake. 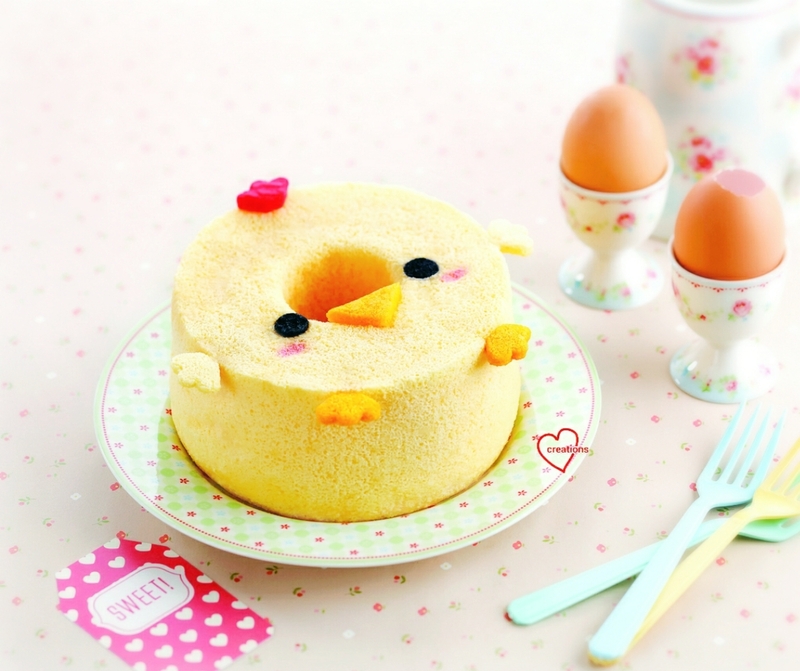 For those who find the cute baby Rooster familiar, the cake is in Deco Chiffon Cakes. For those who want to try out recipe for the plain orange chiffon cake, which is very yummy and flavorful, it can be found below for a 15-cm (6-inch) tube pan. 2. Beat egg yolks with sugar with whisk till pale yellow before stirring in oil and orange juice. 3. Next add in sieved flour, orange zest and a few drops of orange emulco (optional) and whisk till no trace of flour is found. 7. Bake the cake for 15 min at 160°C then 25+ min at 140°C. 9. Unmould by hand (video tutorial) after the cake is cool. For this cute baby rooster version, the eyes were pre-piped onto the tube pan before the orange batter was added. The features were added on using chiffon sheet cakes. The detailed instructions and picture tutorial can be found in Deco Chiffon Cakes book. 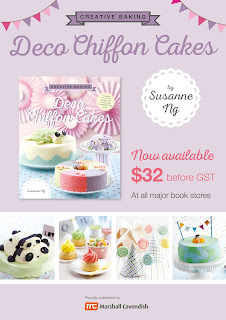 FYI, Deco Chiffon Cakes and other titles are now on festive promo at Popular bookstores! Hi just want to check, in your book it says 18 cm chiffon tin, but you wrote 15 cm chiffon tin here online. so which is the correct size?